Deliveries are made weekdays Mon - Fri (except public holidays). Capital Cities - 1 working day (Overnight). * NB Express Delivery is not available outside of Australia Post's Express Delivery Network. To check whether your address falls within this network please consult Australia Post's Express Delivery Network table (click here). Items that are heavy or bulky cannot be sent Express Delivery. For these items the only shipping method that will be available will be Standard Delivery. Please ensure that you provided us with the correct address including correct Suburb and Postcode. If your address is incorrect and gets returned to the warehouse we will need to charge you a redelivery fee. Shopping from NZ is easy and cost-effective. Orders are shipped from Australia - and shipped locally in NZ by NZ Post. NB Orders to NZ are generally GST free depending on order value (consult NZ Customs' FAQ) - hence you can take 10% off the Australian retail price and delivery fees. 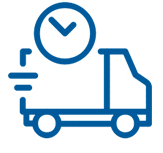 Standard Delivery: expected shipment times are 7-10 business days. We use a third party service to bulk ship items to NZ to reduce your shipping costs. The tracking number we provide you will not have tracking information until your order enters NZ. Once items enter NZ, they can be tracked on NZ Post's website. Note: some larger and bulky items are not available for shipping to NZ. We only ship to New Zealand at this time. We do not ship to other international countries. You may return most new, unopened items, within 30 days of delivery for a full refund (excludes all pillows, quilts and bedding, air purifiers, baby products, SleepPhones, ear plugs, sleep masks and some other products due to hygiene and safety considerations). We unfortunately cannot accept exchanges or returns for these products. We encourage you to make your selection of items carefully prior to your purchase. For returned items item's original packaging is not marked or used as the outer layer of packaging for transport. Please ensure you do not attach anything to the outside of the original packaging. e.g. boxes must be placed inside another box or satchel for shipping. If the item is thought to be faulty we will assess and trouble shoot the issue with you. We may direct you to return the item, or organise a pick and delivery, to us or the manufacturer to further assess the issue. If the item is found faulty, subject to any rights you have under any consumer protection law, we will and at our election repair, replace, or refund the cost of the item. If the item is faulty will then refund the cost of postage by our nominated shipping method (please retain receipts). If the return is a result of our error (you received an incorrect or defective item, etc.) we'll also pay the return and re-delivery costs by our nominated shipping method (please retain receipts). If an item is returned to the warehouse due to a change of mind, an incorrect address, or failure to collect an order from the post office or a courier company, we may charge a return/restocking fee. If a re-delivery is required we may charge a re-delivery fee.